CMA-CGM containers participating in Operation « Containers of Hope »: transporting humanitarian supplies for children, various food and health assistance programs in Africa. Clear and simplistic representation, visible from a distance (on boats) and understood by all. The happy look and smile of this child sums up the mission of « Containers of Hope » and makes it easy to distinguish it from other containers. This proposal included a collaboration with JR, his work mixes art, action, deals with commitment, freedom, identity. Idea proposed during a competition at CMA CGM. Arrival in the final but not selected in June 2012. 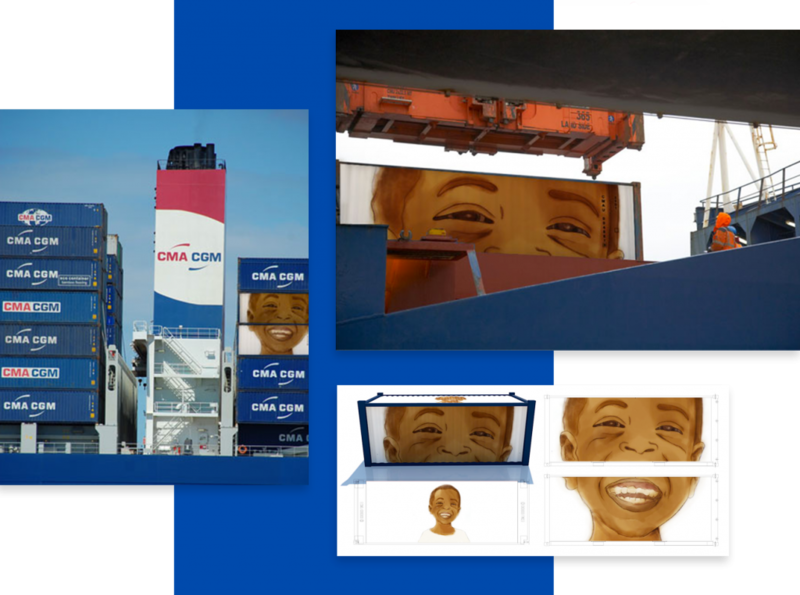 Article of July 2014 concerning the setting up of a work of JR (a giant look) on containers CMA CGM .. >here.